Antoine Le Guen is a french adventure/travel vlogger who is soon to be traveling the world with his girlfriend Violette (the photographer of the team) visiting 100 of the planet’s most amazing places. Their blog, The Vlog Expedition is focused on creating breathtaking videos, including 360 videos of exotic environments, using VR-style technology in their vlogs to allow viewers to share the experience. Antoine is also giving tips for building the next generation of vlogs on his personal channel. Antoine has been vlogging for years and experimenting with different vlogging styles and using different cameras. He has great energy and drops lots of value bombs from the moment you meet him, regarding editing, lighting, filming techniques, new 360 equipment and how to apply them to your youtube, facebook. 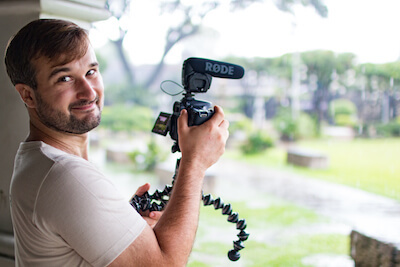 Antoine has previously had many YouTube Channels, experimented and learned not to let perfection get in the way of enjoying the process of creating videos. His peers back in France were not supportive of his storytelling, vlogging passion, and after a life awakening experience of having a disease (now cured), he isn’t letting anyone hold him back from living his passion. His practical approach to using all of his equipment and his honest free-talking style of offering advice coupled with a fabulous accent makes Antoine a great personality and we are happy to hear his thoughts on his camera equipment. 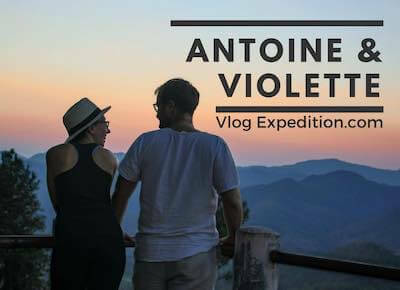 Violette & I created The Vlog Expedition around a simple idea: give inspiration, to tackle global challenges in everyday life. We believe that combining awesome travel stories with useful resources on how to do better with less is the best way to go. Our first vlog series, Expedition 100, will take the audience with us on a massive journey around Earth ticking off our ultimate travel bucket list, meeting incredible people & discovering insanely beautiful places. You’ll be able to explore those places on your own pace with a network of 360 videos included within the vlogs. On the technical aspect, I believe it is time for vlogs to evolve. To me, video blogging is about using videos as the main pieces of content within custom blog posts, that support the story better than only adding cards, comments & thumbs up. I think it is time for creators to take back control of their content and to finally use the possibilities of HTML 5. I see The Vlog Expedition as a challenge where I push my creativity to its limits, including how I think and use the media itself. 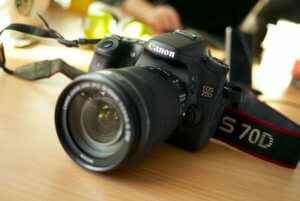 The 70D is still the best camera for vlogging up to date: its cheap, reliable & super user-friendly. The autofocus is just amazing and your footage will look awesome straight out the camera, minimizing the time you spend in post-production which is important if you are just starting vlogging or doing daily. 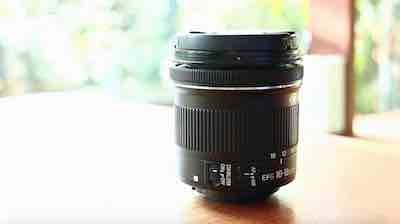 A good camera is useless without the proper set of lenses. This one is my personal favorites and makes a perfect combo with the wide lens combo. I love it because it’s super cheap, light and compact. The aperture is good enough for having a nice bokeh when you’re shooting yourself in on a tripod talking to the camera (use a SmartLav mic though in that case, the 70d will be a little too far for the VideoMic Pro to do its best) and of course, it’s awesome in low light conditions. 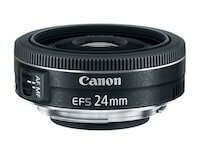 It’s not stabilized but it will do the job fine as it’s wider than a 40mm FF equivalent. I use this one 90% of the time. This is almost the perfect focal length for vlogging, 10mm is wide enough (16mm in FF) on the jobby for selfies and 18mm (26mm in FF) is a decent frame for a more “normal” look. As it’s all plastic, light and cheap like I love it. Super robust, reliable & ok priced shotgun mic. Will do good in all situations as you can adapt the db from -10 to 20. The Video Mic Pro has its own power, having an external microphone is a basic requirement for the 70D as the inbuilt preamp is a joke, so don’t go for the VideoMicro or VideoGo. 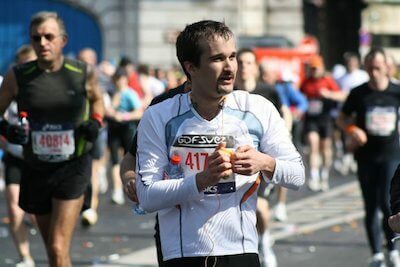 Always have a spare 9V battery with you, in case it switches on and dies in your backpack. 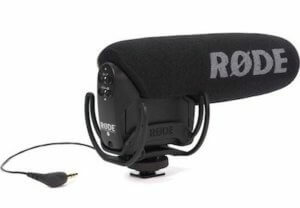 Go for the rycote version. This smartphone has simply the best image quality on the market and I love to pair it with the Gear 360. 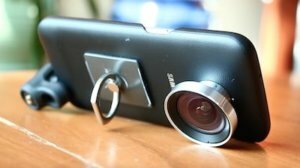 Samsung created a pack with wide angle and telephoto lenses especially for this model which does a better job than third party lenses. It’s particularly useful for steady shots but don’t pan(move it around while shooting) it too much or you’ll get some jello effect (it’s primarily designed for stills). 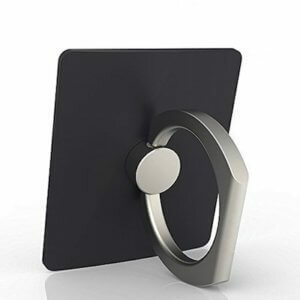 Buy a ring for your smartphone ! 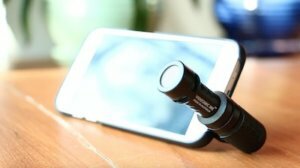 It’s just a few bucks and that will change your life: I found my shots a lot more steady (especially for hyper lapses), I can try any kind of shots since I know I am not going to drop my phone AND I can use it as a stand. This one does a great job if you plan on using your smartphone as a main shooter. It’s a simple plug-and-play system that will dramatically improve your audio quality.